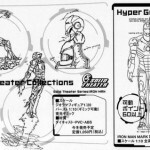 EZHobi Toy unveils their plans for upcoming Iron Man merchandise. 1/10 scale statues are planned for their Solid Theater Collections, and a diecast/plastic poseable figure of the mk III armor is planned for their 1/10 scale Hyper Gokin line. This figure features internal detail, removable armor pieces, swappable hands, glow in the dark material, and is constructed of diecast metal, and plastic consisting of ABS & PVC. Discuss on the Toyark Forums› Views: 5072 › Credit: QuinJester of the Toyark Forums!